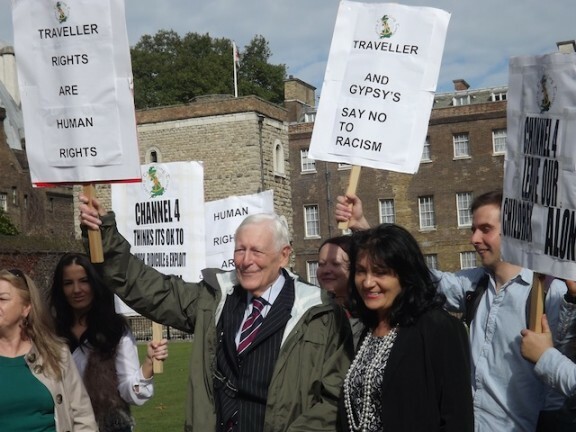 Lord Avebury, ACERT chair and Yvonne Macnamara, CEO of the Irish Travellers Movement in Britain celebrate the Advertising Standards Authority decision on the Bigger, Fatter, Gypsier campaign. The Advertising Standards Authority (ASA) today (Wednesday 03/10/2012) announced that Channel 4’s “Bigger Fatter Gypsier” billboard advertising campaign was irresponsible, endorsed prejudice against Gypsies and Travellers, was guilty of depicting a child in a sexualised way, and was likely to have caused mental and moral harm to children. Details of the case can be found on the ITMB website. ACERT compiled evidence from teachers across the country on the impact that the programmes and the advertising campaign had on relations between Gypsy, Roma and Traveller pupils and other children in school. One teacher described how staff and children anticipated each new series with dread.